This year I have started using Literacy Stations. I used a variation of this system about a decade ago when I taught third grade using Trophies, then stopped when I moved to a new district that was using Reader's Workshop with one on one conferences. Well, we've since switched to Journeys and the time felt right to reboot the stations system. Obviously with common core and a different grade level those old stations would not work for my class, so here is the 2013 version! 1. 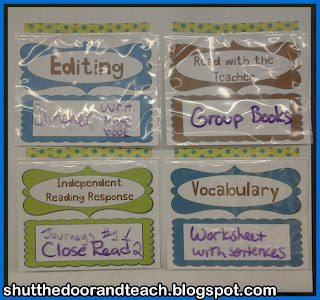 Read with the Teacher, which is basically my leveled reading groups. 2. Vocabulary: Journeys does an AWESOME job with vocabulary. I have the kids complete a preview page the first day, with a short text (from the TM on the back to give them practice using context clues). The next day I use the vocabulary cards that come with the program for students to discuss. Finally, I give them questions from the teacher's manual to complete (5 questions per day). I blogged about these vocabulary questions here, and you can download my free template for Journey's vocabulary questions from that post. 3. Editing: I have started using Mentor Sentences this year to help kids examine and learn good grammar habits in writing. Some day I will make this available in my TPT store, but it's just not ready yet! I also include a spelling game once every 5 days. 4. Independent Reading Responses: We have started using Close Reads for reading responses because I felt that the worksheets with Journeys were just not cutting the muster. I wanted to hone in more on common core skills and creating my own questions were the best way to do so. Once I decided on the tasks involved, I needed a way to quickly change out the groups several times each day. Last year I'd hung up file folders with reading materials inside for each group. There were clips so the kids could be moved each week if needed. After a lot of sketching of wheels and hanging groups off of station titles, I decided to keep the folders and move the center titles instead. And in order to move them quickly, without misplacing any titles (I'm kind of bad at that sort of rotation system) I put them all on sentence strips! That's right, instead of moving around 4 different station tags, I just take the first strip down, and station number 2 is right there. At the end of the day I just put strips 3, 2, and 1 back up and the system is ready for the next day. As you can see, each "rotation" period is color coded. 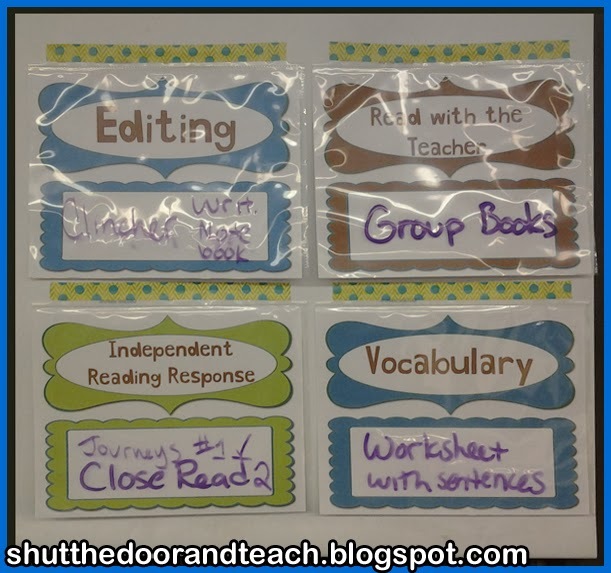 The kids in the reading group with the blue folder know that their first rotation every day is editing, followed by reading with me, then their written response, and finally vocabulary. It was NOT EASY setting up this system. Some things can't be done out of order, such as reading with the teacher and the written response. I really had to flesh out my 5 day schedule to be sure the kids could all work with automaticity when they got to their groups or else I would not be able to focus on my small group. The key is to NOT schedule any groups on day 1. My focus lesson for reading comprehension is a little longer, the kids get time to read their books before we meet, and I introduce the editing skill for the week. For my first year running these new Literacy Stations, it's going pretty well. I'll feel even better next year when my Close Read questions and Mentor Sentences are completed. If you're thinking of trying out Literacy Stations next year, you can download my Literacy Stations one week planning page here for free. 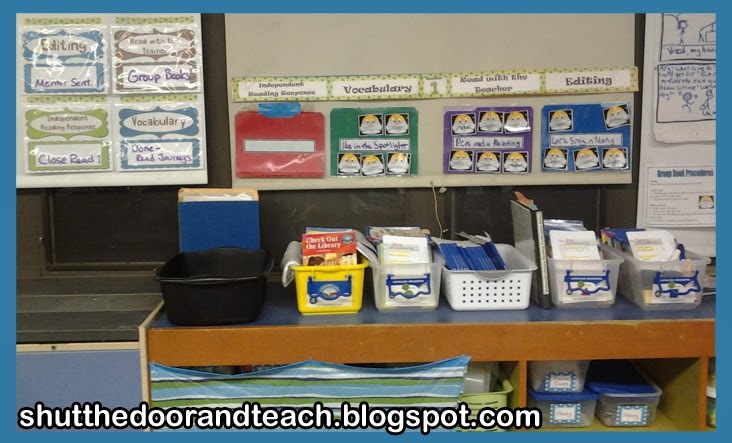 Then, check out my next blog post tomorrow and I'll show you how I organize the materials I use in the stations.